Having started in 1969, the Structural Steel Design Awards are this year celebrating their 50th anniversary. In the fifth and final article, NSC looks back at the past decade, the 2010s. Since the Structural Steel Design Awards (SSDA) were initiated in 1969 by the British Constructional Steelwork Association (BCSA) and the British Steel Corporation there have been many changes in the construction and the steel sectors, but one constant asset is the way that steel not only confers efficiency and economy but also has an aesthetic which designers are able to exploit to the benefit of the built environment. The qualities of engineering excellence, innovation, attention to detail, economy and speed of construction have been brought together in each of the structures that have been given awards during the past 49 years. Following on from last month’s look back at the 2000s, in this issue we highlight the 2010s. Two examples of this decade’s Award winners are the Olympic Stadium (a winner in 2012) and The Kelpies (a winner in 2014). Now known as the London Stadium and the home of West Ham United FC, a number of structural alterations have been made to the former Olympic Stadium since it was the centrepiece of the London 2012 Games. Flexibility was built into the design of the 80,000-seat stadium, as originally it was envisaged that after the Olympics it would be transformed into a 25,000-capacity legacy venue by demounting the upper tier. However, these plans changed and after the Olympics a second construction phase was undertaken that included the strengthening of the main steel frame. This facilitated the installation of retractable seating and a new roof, that is claimed to be largest spanning tensile roof in the world. This second phase of steel construction work was carried out by William Hare. The London Stadium is now a multi-purpose venue with the potential to accommodate up to 60,000 spectators, not just for football, but also athletics and concerts. To provide flexibility in both construction, dismantling and possible legacy uses the original roof was structurally independent from the terrace structure. The roof consisted of a 900m-long ring truss supported on a series of inclined tubular columns. The terrace superstructure consists of precast concrete units resting on large raking lattice girders, which were supported on concrete shear walls at the front and by raking steel columns along the span. The original roof covering consisted of a PVC fabric supported on a cable net with an inner tension cable ring and an outer steel compression truss that was approximately 900m-long and 12m-deep. Working on behalf of the main contractor Sir Robert McAlpine, Severfield fabricated, supplied and erected 10,000t of steel for the original scheme, making it the lightest Olympic Stadium to date. Motorists driving along the M9 near Falkirk are today greeted with the view of two 30m-high equine sculptures known as The Kelpies. The steel structures sit either side of a recently constructed lock on the Forth & Clyde Canal forming the centrepiece of The Helix park in Falkirk. Known as ‘head up’ and ‘head down’, because of their different postures, The Kelpies have become a major Scottish tourist attraction and a highly visible signpost for a large regeneration scheme. Conceived by sculptor Andy Scott and fabricated and erected by S H Structures, The Kelpies are based around two braced triangular trusses, which were inter-connected by braced in-plane CHS frames to form an efficient and stiff primary structure. A secondary frame of smaller CHS rails carry the brackets that provide the thousands of fixing points for the external skin. The sculpture’s skin is formed from stainless steel panels, which were cold formed onto the thousands of individual brackets of the structure insitu. 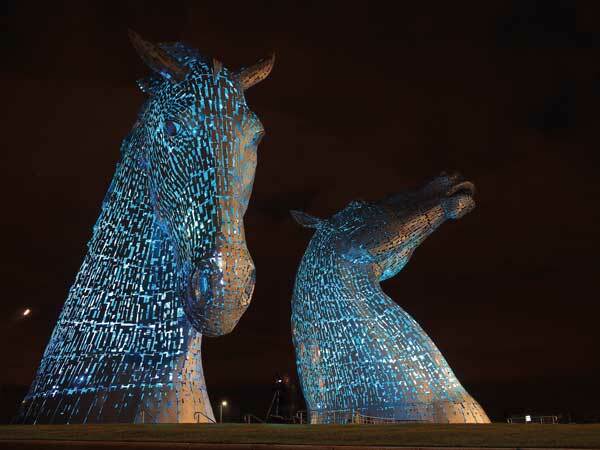 The judges commented that two shimmering steel horse heads, fully 30m high, required considerable engineering finesse to realise the sculptor’s vision. A tubular steel frame supports this most complex and delicate sculptural form. The 2018 Awards, which are jointly sponsored by the BCSA and Trimble Solutions (UK) Ltd, will be announced in early October.